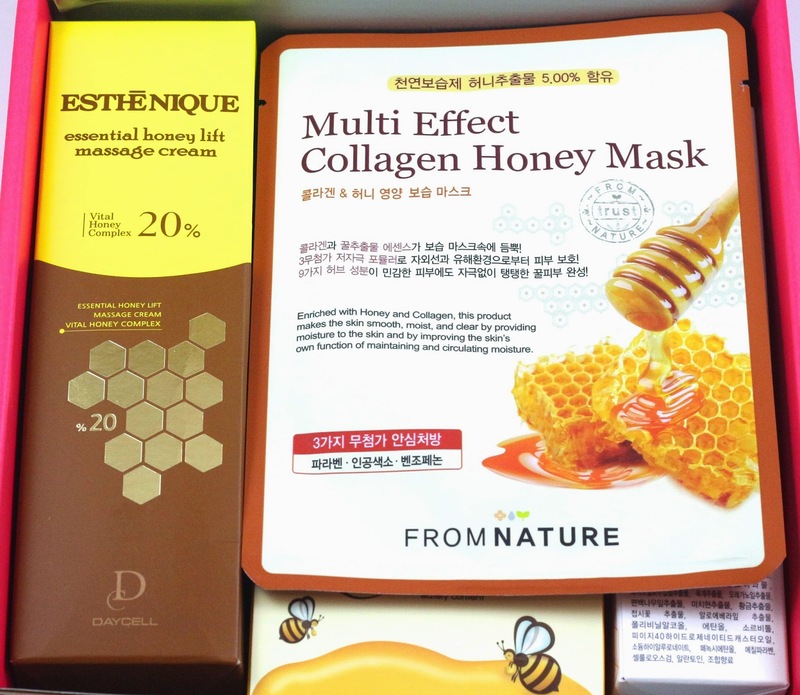 I finally received my Memebox Superbox #53 My Honey Box, which I was really excited about because the first honey box was so amazing! Even though I didn't purchase the first honey box, I'll do a little comparison at the end, so you can be the judge of which one was better. 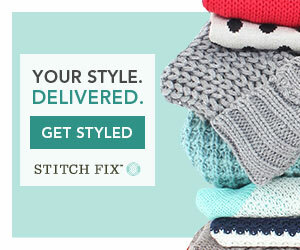 This box was originally $29 (+$6.99 shipping) and is now sold out. Memeboxes shipped standard shipping now take over 2 weeks to get to me because they are sent Registered Mail. The old shipping method usually only took a week. 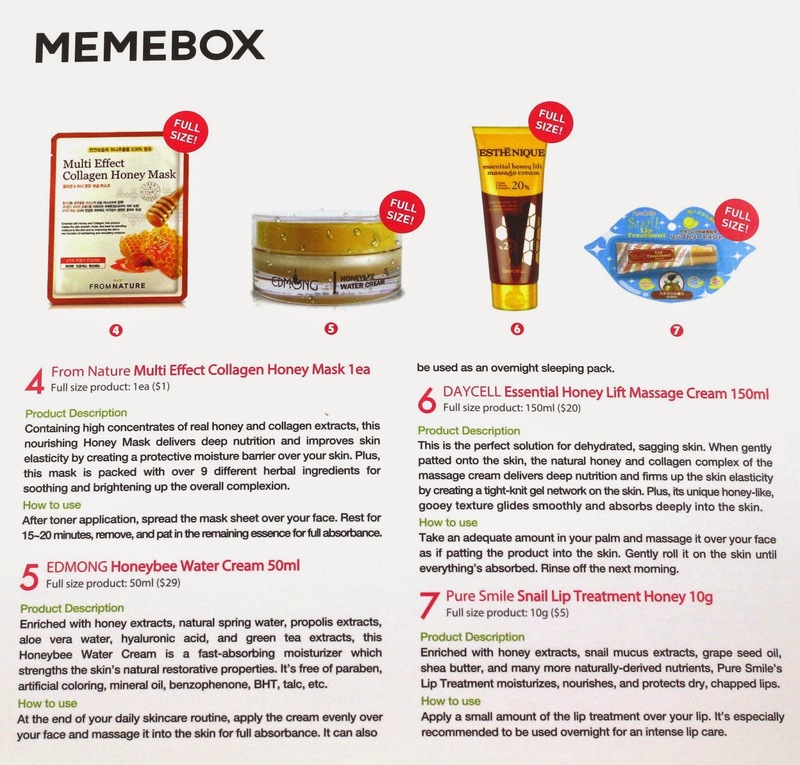 Memebox! Go back to the old shipping! It's not worth it, and especially since now I have to sign for everything. This particular box took 16 days to arrive from Korea to California. I keep all these info cards, and I recently went through my whole Memebox stash and labelled everything clearly with the expiration date, and made a spreadsheet organizing all products by expiration date, so I can replace my skincare routine products with the next product that's set to expire. No wasting! It's so helpful already, I can already see which products I need to grab for next. And since I am now using 5-7 products twice daily, it's really nice to be able to see exactly what to replace which product with which. 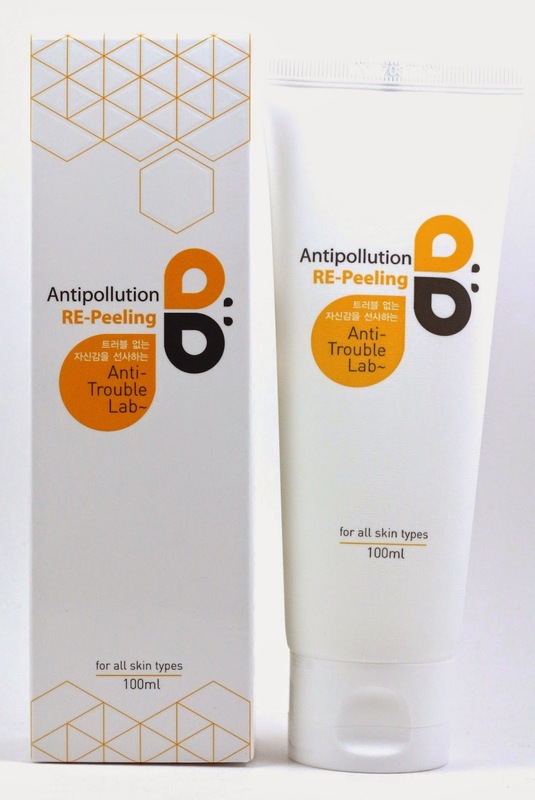 Product description: "This is a peel-off type of facial pack enriched with natural ingredients renown for nourishing and brightening effects - honey, bee venom, propolis, royal jelly. It'll work to exfoliate dead skin cells, blackheads, and whiteheads and to control excess oil and sebum by maintaining the skin clean and well-balanced." How to use: "Spread the pack adequately over your face. The texture will be sticky and honey-like at first but it'll quickly start to dry off according to the skin temperature. Remove when it's completely dried off cheeks." 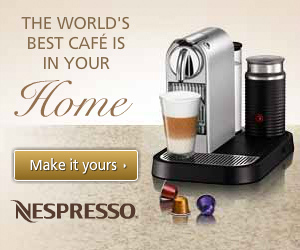 My thoughts: According to their website, this product is not even on the market yet. That's pretty cool that we get a chance to try this product before everyone else does, and it's my first peel off mask! I've seen peel off honey masks before, so I'm looking forward to trying it! Product description: "Enriched with high concentrates of honey, the Manuka Honey Treatment delivers deep nourishment, repairs damaged ends, and provides an intensive protein care to your dry hair. The natural manuka oil infused also works to renew damaged cuticles and restore silky gloss to your hair." How to use: "Towel-dry after shampooing. Take an adequate amount on your palms and softly massage it in throughout your hair. Rinse off after 5-10minutes." My thoughts: I keep saying I'm going to use all these haircare products I get and I never do. Maybe I need to add that to my routine every day, or at least start on one of them. I imagine this product would actually work pretty well for my hair, so maybe I should just use it! 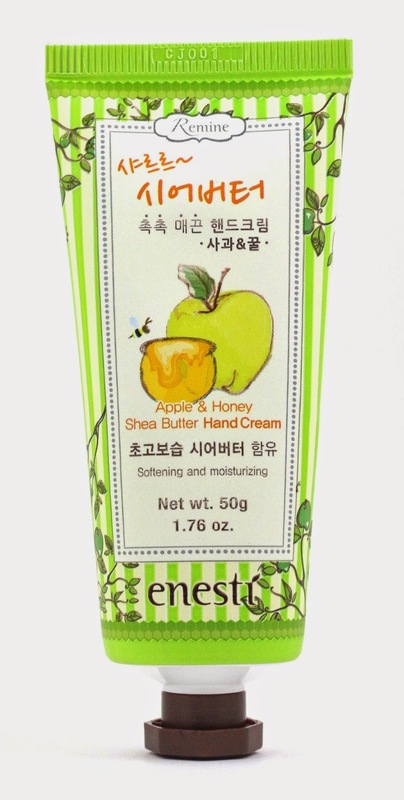 Product description: "The heavily nourishing honey and vitamin-rich apple formula of this hand cream works to moisturize, purify, and firm up dry hands." How to use: "Apply the hand cream generously over your hands as often as possible." My thoughts: I wish Memebox wouldn't send so many hand creams, as I buy a ton already, but out of all of them I've been sent, this one smells the best. It mostly smells like apples, and I can't help but think this would have gone better in some of the recent apple boxes that have released, but it's a light lotion, and smells really good. Maybe I'll use this one for my feet or something in the winter. It would make my feet smell delicious! 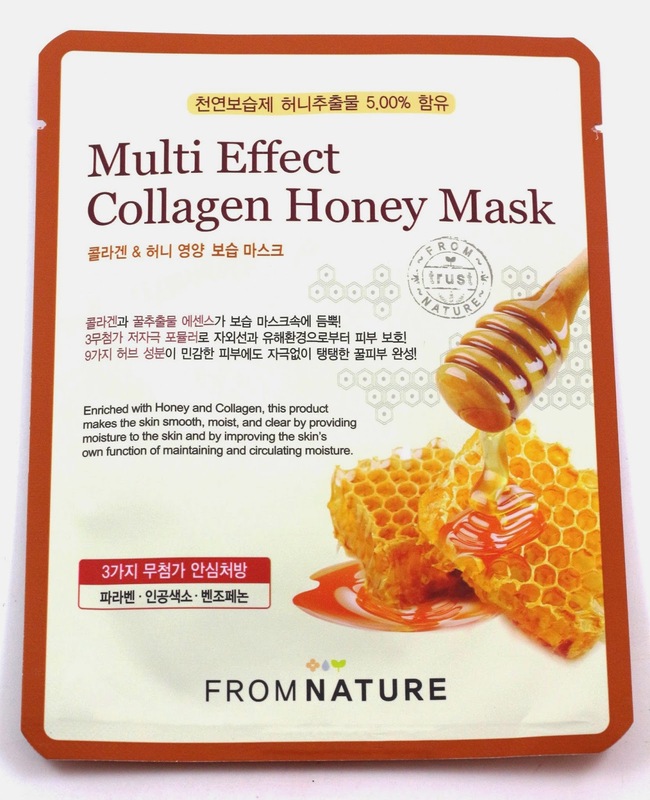 Product description: "Containing high concentrates of real honey and collagen extracts, this nourishing Honey Mask delivers deep nutrition and improves skin elasticity by creating a protective moisture barrier over your skin. Plus, this mask is packed with over 9 different herbal ingredients for soothing and brightening up the overall complexion." How to use: "After toner application, spread the mask sheet over your face. Rest for 15-20 minutes, remove, and pat in the remaining essence for full absorbance." My thoughts: You can always expect a mask in pretty much every Memebox now, but this one looks nice, I've never tried a mask from this brand before. But my collection of masks is quickly growing, maybe I'll use this one tonight! 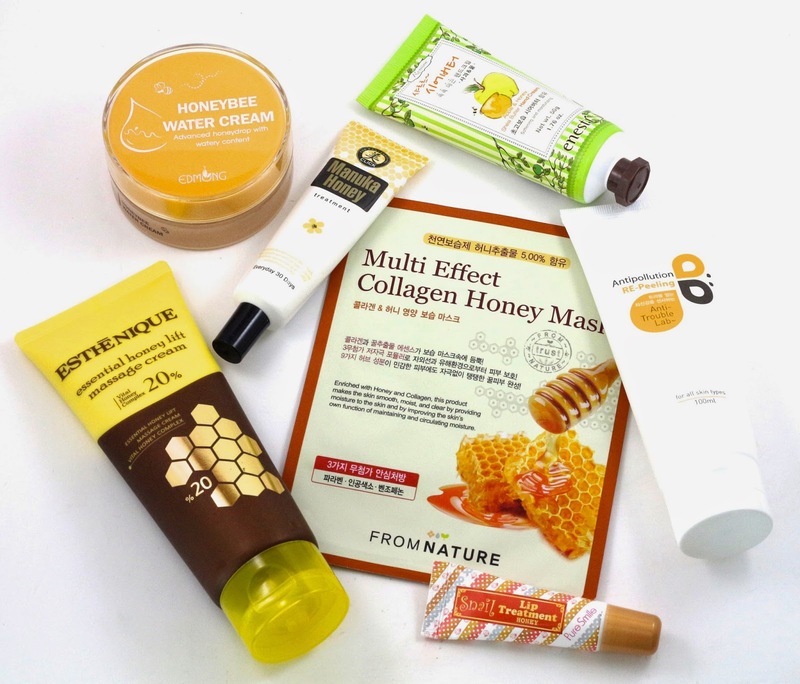 Product description: "Enriched with honey extracts, natural spring water, propolis extracts, aloe vera water, hyaluronic acid, and green tea extracts, this Honeybee Water Cream is a fast-absorbing moisturizer which strengthens the skin's natural restorative properties. It's free of paraben, artificial coloring, mineral oil, benzophenone, BHT, talc, etc." 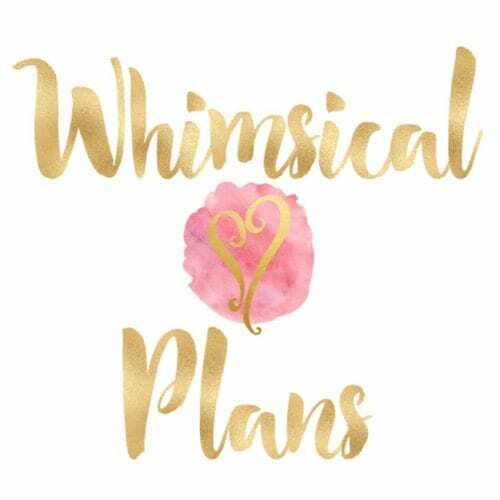 How to use: "At the end of your daily skincare routine, apply the cream evenly over your face and massage it into the skin for full absorbance. It can also be used as an overnight sleeping pack." 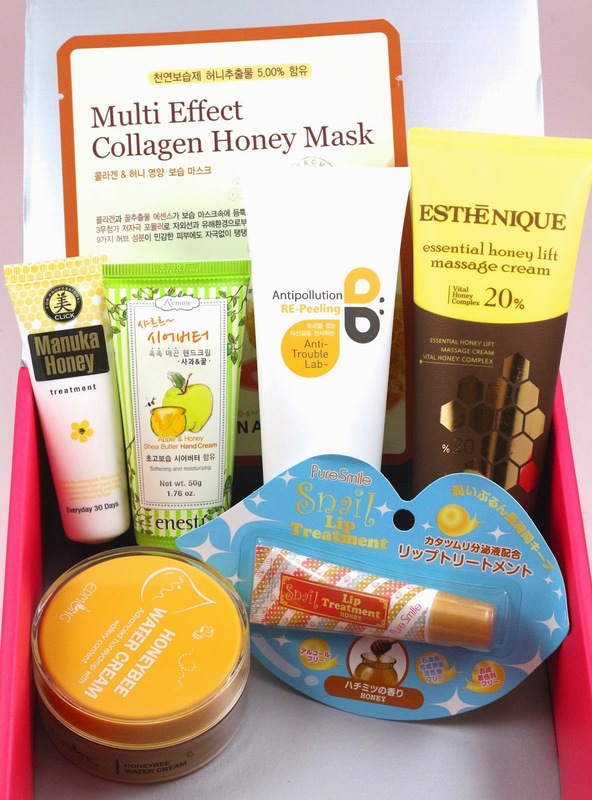 My thoughts: This is probably my favorite looking product of this box, the product itself looks like a honey gel! And I love the sleek packaging, and the fact that it can also be used as an overnight sleeping pack. I like these double duty products, because then it's easy to use them in the morning lightly, or at night in a thicker layer. And it smells delicious, definitely excited for this one. Product description: "This is the perfect solution for dehydrated, sagging skin. 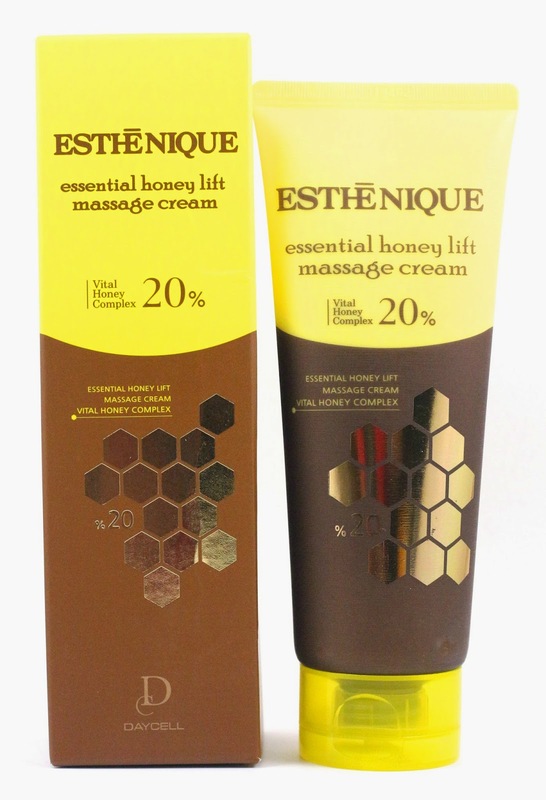 When gently patted onto the skin, the natural honey and collagen complex of the massage cream delivers deep nutrition and firms up the skin elasticity by creating a tight-knit gel network on the skin. Plus, its unique honey-like, gooey texture glides smoothly and absorbs deeply into the skin." How to use: "Take an adequate amount in your palm and massage it over your face as if patting the product into the skin. Gently roll it on the skin until everything's absorbed. Rinse off the next morning." My thoughts: I don't currently use anything in my skincare routine that needs to be washed off the next morning, even though I do wash my face at night and in the morning. But my morning cleanser differs depending on where I am, and which one I am using. But I wonder how well this will tighten up my already young firm skin, so that will be interesting to see. 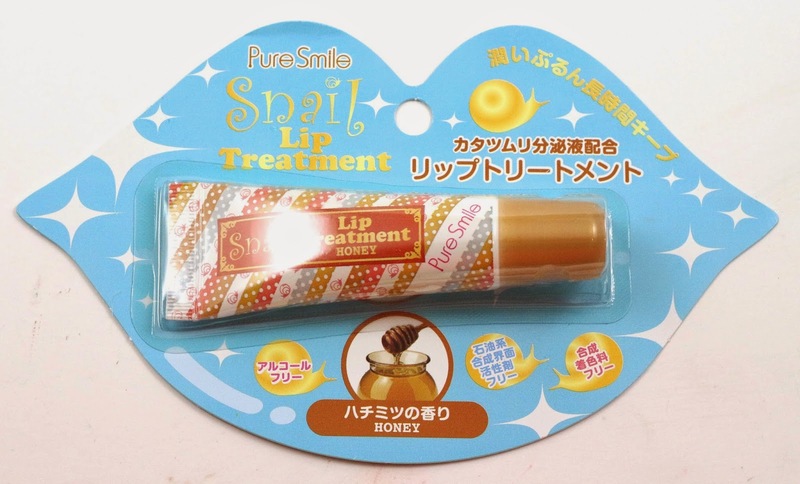 Product description: "Enriched with honey extracts, snail mucus extracts, grape seed oil, shea butter, and many more naturally-derived nutrients, Pure Smile's Lip Treatment moisturizes, nourishes, and protects dry, chapped lips." How to use: "Apply a small amount of the lip treatment over your lips. It's especially recommend to be used overnight for an intense lip care." My thoughts: I used this overnight last night, and it was like a thick gloss texture, it stayed in place well, and my lips definitely felt more moisturized in the morning. So I might just keep this on my nightstand and use it after I wash my face and see how my lips fair for the long run of using this. It doesn't really have a scent, maybe just a slight sweetness to it, but it's clear. Not surprising this was in this box, as the first honey box had a product from this brand and product line as well. 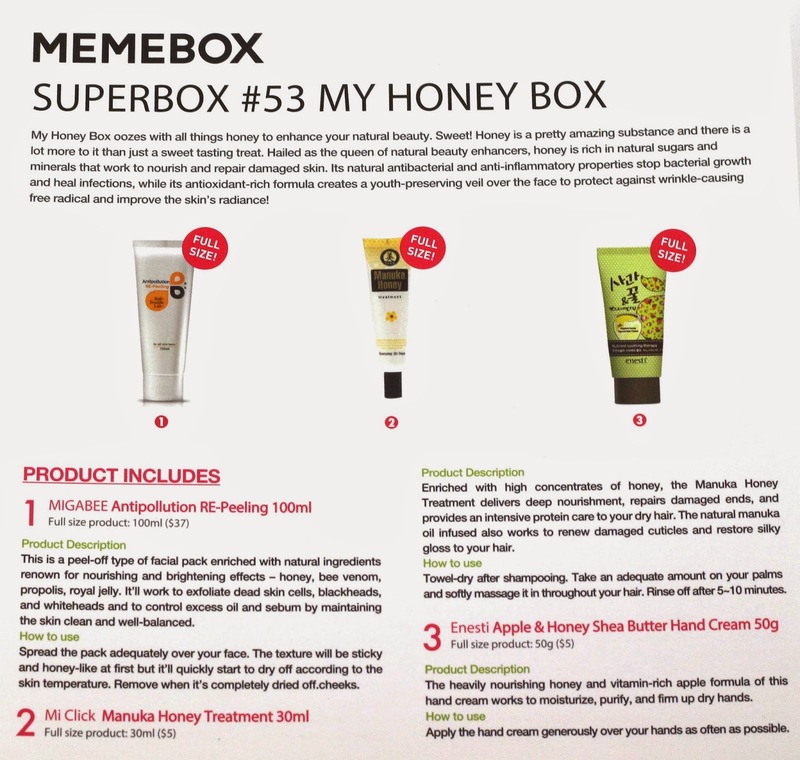 Overall, the Superbox #53 My Honey Box had a total value of $102, according to Memebox prices. I've noticed a general decline in Superbox values, so I may try to skip those unless they are a really great theme for me. But I think this box had a well rounded group of products, skincare, hair, body, lips, etc. I'm really looking forward to the peel off mask, and the Honeybee Water Cream. Those are probably my two favorite products of this box. I think that even though the stated value for each of these boxes is higher than what they actually cost if you were to buy some items separately, most of the items are hard to find elsewhere, and you still do get a great value and range of products in each of the honey boxes. I am glad I was able to recently purchase the Nella Fantasia Honey One Snail Ultra Moisture Cream from the first honey box, and I think if you can find somewhere to purchase just the products you want for a much cheaper price then it might be better for you to just do that after the box contents are released, but you might miss out on other products you may end up really liking. And since the second honey box was $10 cheaper, I think it had a much better overall value. Yes I think the expiration date on that is on the tube itself, on the back, at the very top, stamped into the top flap.